In this newsletter I relate a conversation I had with a godbrother about the relationship between power, self-confidence, self-esteem, submissiveness and humility. He was preparing a course on humility and asked me some questions. How to separate personality from humility? Can a strong person be humble? I see two distinct aspects of humility: dependence on Krsna and acknowledging one’s faults. A strong personality may be better at the former and have more trouble with the latter. But there are healthy and unhealthy ways of being strong. So depending on how balanced a person is, they could also at least act humbly, even if they tend to be domineering by nature. If they work on themselves, they could also restrain their critical side. There is a saying that it is often easier to act your way into a new way of thinking, than to think your way into a new way of acting. The path to humility is paved with the practice of humility, a practice that is done long before humility arises in our hearts. Isn’t this how cultured people act even though they may not be naturally humble? The key is that we see humility as something special, as a most desirable goal. And we should be aware of our own lack of humility. Why is it important for people to believe this about you? What do you doubt in yourself, that you need people to believe this about you? Who specifically do you need to believe this about you? A humble person is submissive. Can a submissive person be proud? Can a proud person be submissive? I am proud to be a disciple of Srila Prabhupda. So there is a transcendental aspect of pride, one that has no ego in it. I know that if I am advancing, I will become more humble. So I must be able to monitor humility in myself. But I should monitor this objectively, without being proud. This can be done, and I believe it needs to be done. I can test whether or not I am becoming more humble, while remaining humble enough to not be proud of my advancement. 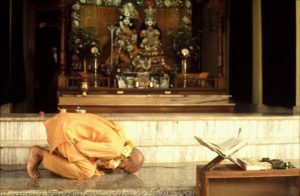 Regarding being proud and submissive, we saw that proud devotees were submissive to Srila Prabhupada. Those who are not naturally humble can be submissive to those they greatly respect. But since a proud person tends to think himself more intelligent than others, he will find it difficult to submit to most people. I define humility as “happy small” and lack of self-esteem as “unhappy small.” Do you agree? Yes. We can be happy being small and insignificant. But one who lacks self-esteem generally finds this difficult as they need recognition. A human’s greatest need is to be appreciated. So, on the human level, this is where we are at. And this doesn’t have to be so bad. But when the need is abnormal, there will be problems. Those who lack self-esteem tend to be self-centered, even neurotic, and are often jealous and envious of others. They are often easily offended and complain a lot about others. So low self-esteem can cause many problems. However, self-esteem problems are not necessarily a consequence of spiritual weakness. A healthy attitude is to be dissatisfied with yourself and strive for the ideal. How is that different from a lack of self-esteem? I would say a better outlook is to be satisfied with where you are at, but strive to be better. By satisfied I mean accept where you are at and focus on where you want to go. Where you are looking to go is more important than where you presently stand. If we use your definition above, we find that if one lacks self-esteem one will usually not strive for high ideals. This is because they won’t feel worthy of those goals, or they will lack the self-confidence needed to achieve those goals. Devotees often have very low spiritual goals. It can be partially due to not feeling that Krsna really cares about them. Or it may be that they don’t really care much about themselves. A bad attitude is being satisfied with oneself and not striving for the ideal. How is this different from healthy self-esteem? What you describe is tamo-guna. If you are not striving to move forward, then being satisfied keeps you down. My understanding of healthy self-esteem is that you think you are lovable and worthy of success, and that you don’t deny what’s good about you. If you are not striving to improve yourself in some way, you might lack self-esteem because you don’t think you deserve better. If you are satisfied in goodness, you won’t be lazy. You will be satisfied with whatever you achieve, but it doesn’t mean you won’t try to be the best you can be in all that you do. Can a person with low self-esteem be spiritually advanced? Can a person with healthy self-esteem not be spiritually advanced? Is there an absolute correlation between the two? Yes, to the first two questions. But if one has low self-esteem, it can be an impediment because of the need to pull others down. Of course, high self-esteem doesn’t guarantee spiritual advancement, but generally such persons have an easier time confronting and dealing with their faults. I find that many of the devotee’s problems come from not loving themselves, that is they neglect their sadhana because they don’t care enough about themselves to be strict. Also, they may offend devotees, not always because of spiritual weakness, but because of negative psychological factors. Do you agree with the statement, “Humility is to be happy feeling oneself small? Highest consciousness: being “happy small” and happy with who we are, despite our shortcomings. Yes, we really need to be happy with who we and where we are at in our Krsna consciousness. In the Bible it says if one criticizes you, take it as a pearl, as something of value, because you can now improve yourself. If we are reluctant to look at our faults or have others point them out to us, we prevent ourselves from improving. So a humble person is happy to find out how to improve. Unfortunately, in spiritual circles, it is not uncommon for people to become proud because of the high honor given to them. Highest: Being happy small, being secure in what we are, and not lamenting for what we are not. Lowest: Not being happy small, wanting to be great (ego), condemning oneself and being jealous or envious of others. Yes, and rather than highest and lowest, I see this more as healthy and unhealthy. To what extent is a lack of self-esteem a spiritual problem and to what extent is it a psychological one? In most cases it is a material/psychological problem, which may or may not be solved spiritually, depending on the severity of the problem and the nature of the individual. It will be a spiritually based problem when one misunderstands humility and tries to feel himself to be like a worm in stool, not understanding that such thoughts are a byproduct of love of Krsna. Of course, you have to answer this question on a case by case basis, but I am seeing that often the problems devotees face are psychological rather than spiritual. What is your definition of humility that covers all bases? 1. Dependence on Krsna, meaning I am not the doer. If I think in this way, I inherently feel like Krsna can have confidence to put people’s lives in my hands, because I know that my power comes from Him. If I don’t think this way, He won’t trust me – and He might even kick me out! 2. A desire and willingness to see my faults, either by my own introspection or from other’s input. This also means not focusing on other’s faults. If I focus on improving myself, and I have a willingness to admit my faults, then I lose the need to focus on other’s faults, which, of course, harms me.